Troubled couple Louise (lovely, lovely Luana Anders) and her husband John are staying at his family castle in deepest, darkest Ireland. The family have gathered for the annual memorial service of John’s sister and the reading of his mother’s will. Taking a midnight jaunt in a row boat, Louise and John discuss his mother’s will, they argue and he reminds Louise that if he dies before his mother, she will not see a penny of the inheritance. As she tries to persuade him to talk his mother into changing the will, he has a heart attack and dies. Louise sees the opportunity to worm her way into her mother-in-law’s favour and tips John’s body into the lake, later faking a note from him stating that he had to return to New York on urgent business. She hatches a plan that involves driving the mother insane by making her believe that her dead daughter has come back to haunt her and will therefore be more easily persuaded to change her will. All does not go according to plan though as a deranged axe murderer begins to hack his way through the disintegrating family unit gathered at the gothic castle. Francis Ford Coppola, like many directors, cut his cinematic teeth working under Roger Corman. 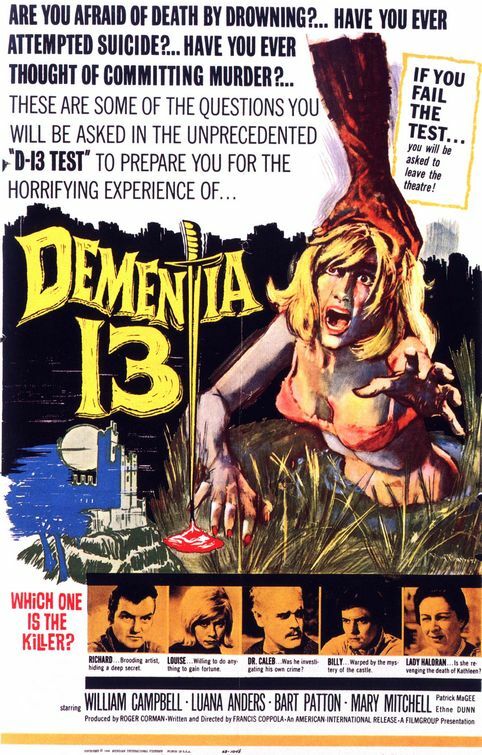 Persuading the producer to let him direct a horror film in Ireland where they had just completed filming The Young Racers, Coppola and Jack Hill knocked out the script for Dementia 13 in a matter of days. Using left over cast and crew from The Young Racers, they set about filming what Coppola would later regard as his directorial debut (he conveniently forgot about his actual debut a dodgy skin-flick called Tonight for Sure). 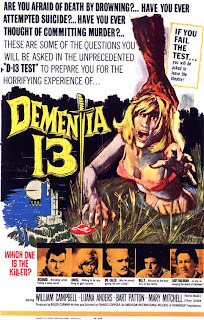 When Dementia 13 was screened in cinemas, it was preceded by a hokey William Castle-like gimmick in which audiences had to take the 'Dementia 13' test to ascertain whether or not they were of sound enough mind to be able to withstand the film's horrific brutality and thrills. Essentially a violent variation on Les Diaboliques, Dementia 13 is about one character’s ruthless desire to drive another to insanity for selfish gain. Their efforts to do so drag up dark family secrets that have murderous consequences. The moody and intriguing opening with the arguing couple in a boat in the middle of a lake contains one of the film’s most striking moments. After Louise pushes her husband’s body in the lake, she also chucks in his transistor radio. It continues to play gurgled rock’n’roll tunes as it sinks further into the depths of the lake after John’s body. This scene has an eerie beauty and unease that much of the rest of the film struggles to live up to. We are also introduced to the other members of the family: the sensitive and somewhat fragile brother Billy (Bart Patton) and his moody and prone to angry outbursts sibling Richard (William Campbell). Richard’s fiancée Kane (Mary Mitchel) also arrives from America to stay with the family. And then of course we have the imposing lady of the house, Lady Haloran (Ethne Dunne). Deeply affected by her daughter’s untimely death, this morose matriarch ensures the memory of Kathleen forever hangs heavy over the house like a death shroud. The sinister family physician Dr Caleb (played by the always splendid Patrick Magee) also comes to stay when Lady Haloran suffers from a dramatic swoon at her daughter’s graveside. An effectively creepy scene unfolds as Louise investigates Kathleen’s room, untouched since her death six years ago. Coppola fills the scene with shots of sinister looking toys including a wind-up chimp with a hatchet. Nice. Gathering some dolls, Louise makes her way to the pond where Kathleen drowned. Lowering herself into the murky depths, in another eerily shot underwater scene, she submerges the dolls so they will later float ominously to the surface and startle Lady Haloran. Louise herself is startled when she sees what looks like Kathleen’s body and an underwater shrine. Thrashing her way to the surface she is then startled and somewhat graphically butchered by a dark figure with an axe. This is followed by the rather raw and unsettling image of her body being dragged away. Unceremonious to say the least. Coppola’s obsession with the dysfunction of the family unit is at play here as much as in later films such as something called The Godfather. The director’s interest in how people are able/unable to co-exist in a family unit and the things they do to each other out of love and selfishness is really at the heart of this film. Suffocating loyalty to family and dark secrets returning from the past to ruin chances of a happy future also pumps through the heart of Dementia 13. The troublesome relationship of several brothers is also a theme Coppola would return to again. It is interesting to see how Coppola addresses such notions in light of the films he would eventually go on to direct. ‘Have you ever been to my bedroom? You have to go down a corridor where no one has lived for the last fifty years. Up a flight of stairs where my great grand uncle or someone, fell and broke his neck. Then go past the spot where my grandfather died of a heart attack. I’d rather be depressed here than up there.’ Ok Billy, point taken. Every now and again something will happen or someone will say something to remind us that despite all the American accents, we are still in Ireland. 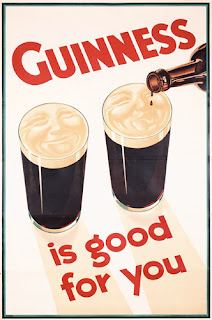 A visit to the local pub provides us with vital information about the identity of the killer, the reason why our irish brother's have American accents (they were privately educated in America you see) and also with the sight of some old Guinness posters. Dr Caleb also utters the immortal line: ‘Drink’s the only road to survival in this climate.’ Ne’er a truer word spoken by a pretend Irish person, doc. Several characters that exist on the periphery of the story, such as Simon the Oirish poacher, say things that apparently Irish people say all the time, such as: 'By the beard of Finn McCool!' I half expected someone to pipe up and say 'ye'll never get me lucky charms.' They didn't. An early scene also takes us into an Aer Lingus airport where we are even greeted in Irish - 'Céad míle fáilte!' Maybe its just me, but I thought this was one of the most thrilling moments of the whole film! Yup. I think it was just me. Apparently the idea of an early variation on the slasher film, set in Ireland, doesn't really excite anyone else. Anyway - I digress. I came across this blog when looking for images of Dementia 13 to "borrow". James, your writing style is fantastic. I'm no horror aficionado but I am a fan of well-written, analytical film reviews. Kudos! Thanks so much! Random discovering of blogs is great, isn't it?